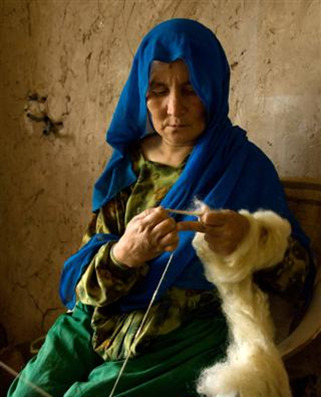 hand spun in Afghanistan by women being paid fairly for their work. Afghanistan is currently very dangerous, so we do not expect a shipment this year. We hope for peace to arrive soon. From The Mountain specializes in bringing the skills and products of artisans worldwide to new markets. We work to sustain handcraft traditions that have evolved in harmony with local ecosystems and are culturally significant. "Absolutely luscious," "silky as butter," and "incredibly soft" are some of the ways knitters have described our hand spun 100% cashmere yarn from Afghanistan. Betsy Greer writes, "Given her upbringing, it was only natural that Susan Inglis would grow up to work with handmade items. Her father was a woodworker. Her mother was a potter and a weaver. Her grandmother sewed, knit and embroidered..."